Congratulations! If you are reading this, you have passed your technician’s exam and you are now qualified to operate a ham radio. You have been given your own call sign, you have gotten your radio equipment ​squared away, and you are anxious to start communicating over the air. But do you really feel prepared to initiate that first contact? If you haven’t been working with another ham operator, you really should take some time to listen to other conversations, to get a feel for how a conversation progresses, before you jump in and do something you may regret later. If you were ever a Citizens' Band (CB) operator, you need to forget almost everything you did while talking over CB radio: it is nothing like ham radio, and you could make a serious mistake if you use CB jargon. Check out our article about CB vs ham radio to learn more about the differences. Ham radio operators generally don’t use codes as a substitute for something; let’s go back to the CB radio example. If you were on a CB, you could ask someone’s location by asking, “What’s your 10-20?” That will not work in ham radio, so don’t confuse the two. If you hear a conversation and you want to get involved and go on air with the phrase, “Break, break,” you may find yourself chewed out by someone else on air. In ham radio, the phrase ‘Break, break’ is only used when someone has a real emergency. You will sometimes encounter a situation where you need to use the International Q Code, which is a basic code that allows ham radio operators to exchange information. Keep a list handy so you can see the code phrases at a glance. Once you find a good frequency, don’t immediately jump on the air flashing your call sign. ​You may be interrupting an ongoing conversation, and that will be considered rude. You will key your microphone before you talk, un-key the microphone, wait a few seconds before you speak, and then commence with your conversation. If you don’t, the first few seconds of your conversation won’t be heard. If you want to communicate like a pro on your ham radio, remember to be polite and just talk to the other person as you would in a normal conversation. There are great ham radio operators out there who will be happy to answer your questions. At times you may encounter someone who doesn’t have the time or doesn’t want to help out: that’s OK, just ask someone else. Be prepared to make a few mistakes: it’s OK, and sometimes it’s the only way to learn something. You need to make that first initial contact, so use the phrase CQ once you have found a frequency that isn’t currently being used by another station. A rag chew is a long conversation, where you give the other operator your basic information, and then the two of you engage in a conversation. Since you are talking with someone you do not know, you may want to avoid in-depth conversation about politics and religion! If you are monitoring a conversation between two ham operators and you’d like to join in, the polite way to do so is to state your call sign. This indicates that you are there listening and would like to join in. One of the most valuable pieces of equipment you can have at hand is a pad of paper and a pen. Make notes of the various contacts you have, noting their call sign, location, and what took place during the call. Don’t forget that you need to identify yourself (by giving your call sign) every ten minutes and at the end of your communication. The community of ham radio operators tends to be great folks who want everyone to have a good time, so you will begin to cultivate a group of people you can chat with on a regular basis. Getting involved with a local club will help you break the ice and get to know those in the area who are ham radio operators. From celebrities to regular folks, long distance truckers to someone stuck inside during a snowstorm, you have the opportunity to chat with a wide variety of other ham radio operators. Jump into this hobby with both feet: you are going to have a great time! 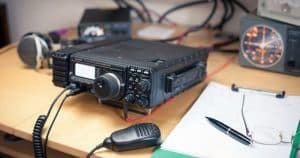 We hope that these 15 tips will help you ease into talking on your new ham radio without sounding too much like a newbie. And oh, by the way: new ham radio operators are often called “elmers”, so don’t be surprised, or insulted, if you get called that a few times along the way. In no time, you will be calling other ham radio operators ‘elmer’ because you’ll be an old pro by then!